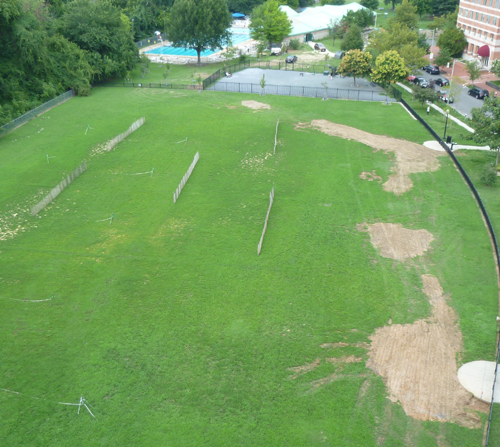 When the board of directors of the Friends of Francis Field (FFF) agreed in April 2016 to try again to improve the central playing field with private funds, the field remained largely bare dirt in the center, as it had for many years. A photograph taken at that time is shown below. We knew that our private landscape contractor would have to decompact the central area of the field, where years of hard use and lack of maintenance has made the soil so hard and dry that almost nothing would grow. But the job was made harder and more experimental by three factors. The first was the time frame we were given: the hot Washington, DC, summer was the worst time of the year to plant grass. The second was the Environmental Protection Agency's regulations concerning "soil disruptions" of certain sizes and locations. The third was the lack of running water on the field. We found that even the drinking fountain we had installed in 2010 was no longer working. Our only water supply was a spigot on the outside of the Francis Swimming Pool. By putting a series of sprinklers on battery-powered timers, only one would fire at a time, but each of the five would have sufficient water pressure. If this approach failed, at least we would not wind up with a larger area of bare dirt because of our attempt to plant in summer with inadequate irrigation. By the end of July, the District of Columbia had agreed to our need for running water, and approved to a plan to run a line from the swimming pool to repair the water fountain, and to install two new field hydrants. This involved digging up part of the field to install the lines. 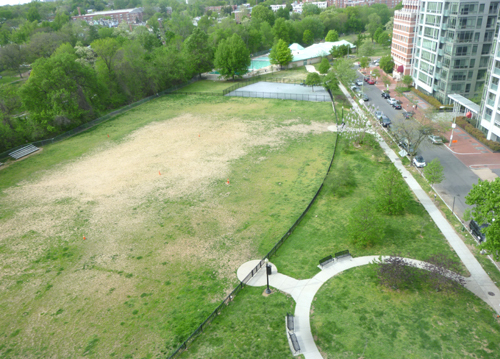 The series of holes that were dug to install the new water lines are shown in the photo at left, which also indicates the green appearance of the field provided by the new grass and the invigorated weeds. Additional rows of snow fence were also added to support the message that the field was closed, both to league play and casual use. September 2017 turned out to be a fairly dry month, with only 1.43 inches of rain, compared to the normal September rainfall of 3.72 inches. Thus, the sprinklers needed to be run during the entire month. Another planting and fertilizing will take place in October. 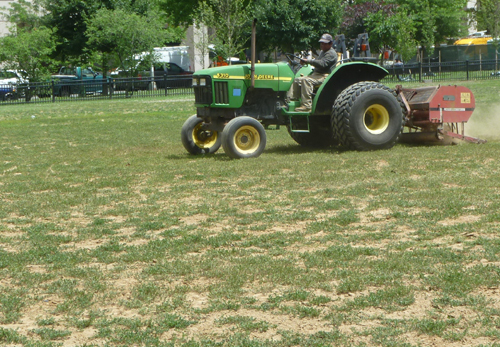 The field will remain closed during the fall and winter to allow the grass to grow, settle, and mature. Plans are to open the field to permit holders on March 17, 2018, for the spring season.